Fryar caught 67 passes for1196 yards (17.9 avg.) and 11 touchdowns in college, including 40 for 780 yards (19.5 avg.) and 8 TDs as a senior in 1983, when he was a consensus first-team All-American. He was chosen by the New England Patriots with the first overall pick in the 1984 NFL draft. In an injury-plagued rookie season Fryar caught only 11 passes and was used primarily to return punts, averaging 9.6 yards on 36 returns. In nine years with New England that were marked by numerous off-field issues through 1992 he accumulated 363 pass receptions for 5726 yards (15.8 avg.) and 38 TDs and returned 206 punts for a 10.0 average and another three scores. Fryar was a Pro Bowl selection in 1985. Moving on to the Miami Dolphins in 1993, Fryar was productive, garnering Pro Bowl honors twice more in 1993 and ’94. Over the course of three seasons he caught 199 passes for 3190 yards (16.0 avg.) and 20 touchdowns. 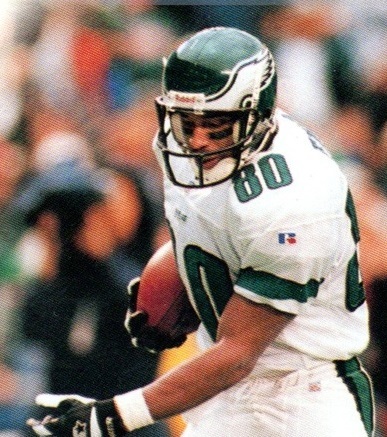 Fryar signed with the Eagles as a free agent in 1996. Eagles went 9-7 to finish second in the NFC East and qualify for a Wild Card playoff slot while leading the NFC in total yards (5627). Lost NFC Wild Card playoff to San Francisco 49ers (14-0). Fryar followed up in 1997 by catching 86 passes for 1316 yards (15.3 avg.) and 6 touchdowns and again receiving Pro Bowl recognition. With the Eagles dropping to 3-13 in 1998, his production slipped to 48 pass receptions for 556 yards (11.6 avg.) and just two TDs and Fryar announced his intention to retire. However,he reconsidered and joined the Washington Redskins for two last seasons in 1999 and 2000. Overall Fryar finished with 851 catches for 12,785 yards (15.0 avg.) and 84 TDs, with 222 receptions for 3067 yards coming with the Eagles. Fryar received second-team all-conference honors twice and was selected to five Pro Bowls. Cannon was a star all-purpose halfback in college who rushed for 1867 yards while averaging 5.2 yards-per-carry, caught 31 passes for 522 yards, and scored 21 touchdowns. He was a two-time consensus first-team All-American and winner of the 1959 Heisman Trophy, following a season in which he also returned a punt 89 yards to key a LSU win against Mississippi. Cannon was chosen by the Los Angeles Rams as the first overall pick of the 1960 NFL draft, but signed with both the Rams and Oilers of the new AFL. A judge’s decision awarded him to the Oilers and he had a fair rookie season, rushing for a team-leading 644 yards and scoring a touchdown in the AFL Championship game on an 88-yard pass play. He was a second-team All-AFL selection by the league. Cannon followed up in 1961 by leading the AFL in rushing (948 yards) and all-pupose yardage (2043) and he capped the year by scoring the only touchdown in Houston’s league title game win over the Chargers. Cannon suffered a back injury that limited his effectiveness in 1962, holding him to 474 rushing yards although he still caught 32 passes for 451 yards and scored a total of 13 touchdowns. He saw little action in an injury-plagued 1963 season and was traded to the Oakland Raiders, where he was tried at fullback with some success before being shifted to tight end in 1965. Cannon caught only 21 passes combined in his first two seasons at the new position. Raiders went 13-1 to finish first in the AFL Western Division while leading the league in scoring (466 points) and TDs (68). Won AFL Championship over Houston Oilers (40-7). Lost Super Bowl to Green Bay Packers (33-14). 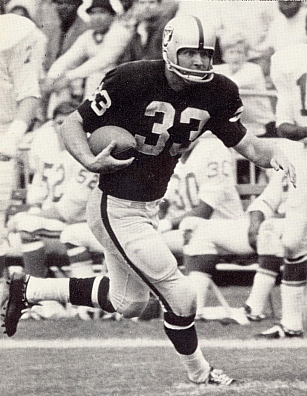 Cannon spent two more years with the Raiders and was an AFL All-Star in 1969. He spent one last year with Kansas City as a backup in 1970. Altogether, he rushed for 2455 yards on 602 carries (4.1 avg.) with 17 TDs and caught 236 passes for 3656 yards (15.5 avg.) and 47 touchdowns. Cannon was a consensus first-team All-AFL selection after one season, received some first- or second-team recognition after three other seasons, and was chosen to two AFL All-Star Games. His son Billy Jr. played linebacker for the Cowboys for one year. At Texas A & M Hector rushed for 2587 yards and 20 touchdowns and gained another 516 yards on 67 pass receptions. 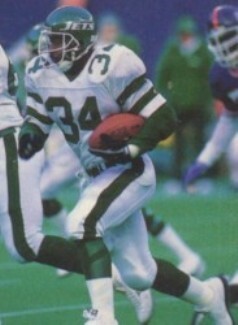 He was selected by the Jets in the second round of the 1983 NFL draft. Hector primarily returned kickoffs during an injury-marred rookie season and saw more action in the backfield in tandem with RB Freeman McNeil in ’84, rushing for 531 yards and catching 20 passes for 182 more yards. He gained another 572 yards on the ground in 1985. In 1986, he ran for 605 yards and showed off his ability near the goal line by scoring 8 TDs. Jets went 6-9 in the strike-shortened season (three games were played with replacement players) to finish fifth in the AFC East. Hector spent another five seasons with the Jets performing as a capable backup and occasional starter. He rushed for 561 yards and 10 touchdowns in 1987 and gained a career-high 702 rushing yards in 1989.His overall rushing total was 4280 yards on 1051 attempts (4.1 avg.) with 41 TDs.He also caught 188 passes for 1661 additional yards and another three touchdowns. Following a fine college career at Fordham, Danowski signed with the Giants in 1934.After an injury to starting tailback Harry Newman during his rookie season, Danowski led the Giants to the NFL Championship with a stunning win over the Bears in the so-called “Sneaker Game". A precision passer and effective runner and punter who also played well on defense, he continued to direct New York’s single-wing offense in 1935. Giants went 9-3 to finish first in th NFL Eastern Division. Lost NFL Championship to Detroit Lions (26-7). Danowski spent another five seasons with the Giants. He led the NFL in passing one more time and led New York to another league title in 1938. Danowski left the Giants in 1940 and played for the Jersey City Giants of the minor league American Football Association, leading the circuit in passing as he threw for 732 yards and 7 TDs. He saw limited action in a return to the NFL Giants in 1941, his last pro season. Overall in the NFL Danowski passed for 3817 yards and 37 touchdowns. He received consensus first-team All-NFL honors twice. Danowski served in the Navy during World War II. He returned to become Fordham’s head coach from 1946-54.